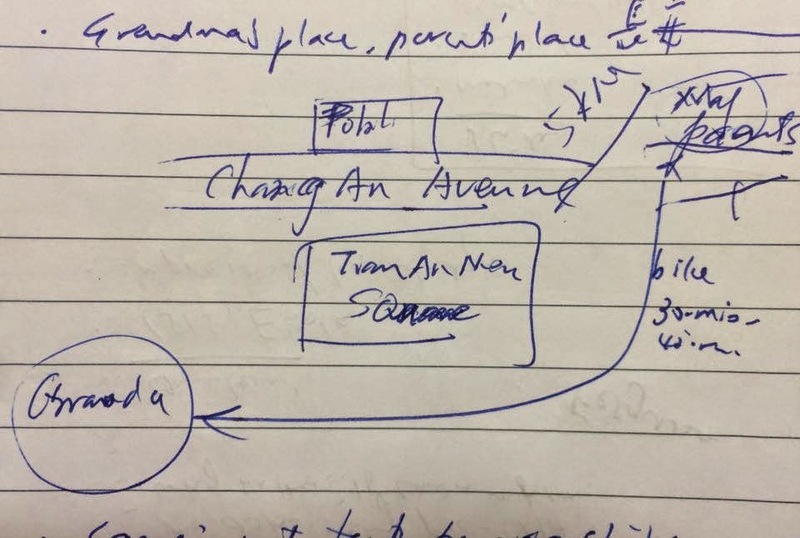 Edward arrived at the vehicle-free Connaught Road expressway and surveyed the Admiralty protest site, which, until then, he had only seen on CNN. 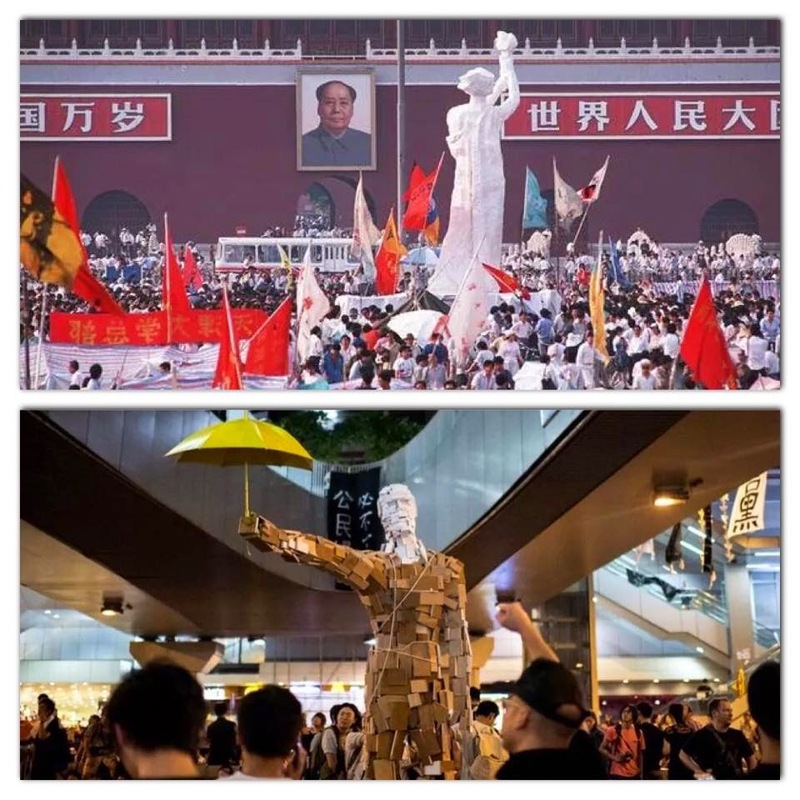 It was 18 October, Day 20 of the largest political event in Hong Kong’s post-Handover history. The 40-year-old law firm partner had just returned from a business trip in London that had kept him out of town for the last two weeks. He climbed over the median barrier and studied the wall of pro-democracy signage written in a few dozen languages. From his elevated vantage point, he could see metal barricades blocking major arteries that connect the financial district to the rest of the city. Protesters had reinforced the roadblocks with garbage cans, wood pallets and water-filled barriers, held together with household cable ties. He took out his phone to snap a few shots, and heaved a sigh. Xiaobing would turn 15 in a few days and Nai-nai, his grandmother, had baked him his favorite sweet buns. The evening before, Xiaobing had biked the five-kilometer distance from his home near Chang’an Avenue (長安路) to Nai-nai’s place southwest of Tiananmen Square to pick up the buns. That his school had recently suspended classes had given the teenager with plenty of free time. The entire Beijing had been in lockdown since May, after students from Peking University began camping out on Tiananmen Square. Many streets along Xiaobing’s bike route had been blocked by makeshift barriers built by local residents using whatever materials they could find on the streets. According to Xiaobing’s father, a military officer, the roadblocks were there to stop soldiers from entering the city and harming the students. 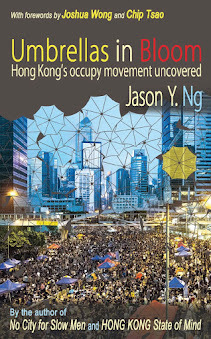 Inside the tent city at Admiralty, Edward slowed his pace to take in the new way of life that had coagulated in the past three weeks. The sprawling maze of camping tents were flanked by shower facilities and first aid stations. At an area labeled “Study Room,” student protestors hunkered down to do homework, while volunteers patrolled up and down the aisle offering snacks. Edward walked up to one of the supplies tents to survey the inventory: bottled water, crackers, umbrellas, blankets and foam mats. “Would you like a drink of water?” the station manager offered, handing him a bottle. “No, thank you,” Edward replied, “but may I ask where you got all this stuff?” “Everything was donated,” the manager said matter-of-factly. “Excuse me for a second,” she apologized, before turning to a delivery man who had just arrived with a load of supplies. A fruit vendor had sent four boxes of bananas and two crates of Chinese pears. 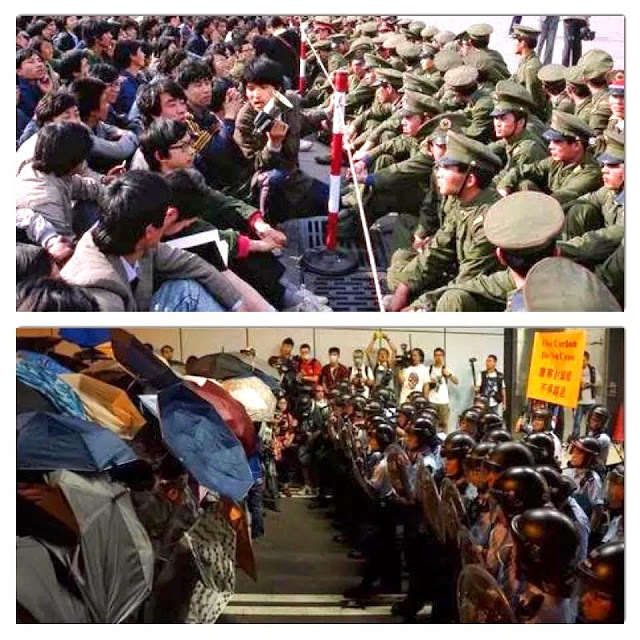 Peking University students had worked out a division of labor on and off Tiananmen Square: liberal arts students would give speeches and hand out flyers on major intersections, while engineering and science students would work behind the scenes to build tents and transport supplies. Some came up with the idea of releasing balloons to ward off reconnaissance helicopters dispatched by the military. Many students had gone on a hunger strike, some even stopped drinking water altogether. But that had not stopped concerned citizens from taking food to the square by tricycle. Many parents prepared homemade red bean soup and other desserts; others provided hand towels and clean clothes. Xiaobing too wanted to give away Nai-nai’s sweet buns, even though he did not really understand why students had occupied the square. They spoke of democracy and reform, and used big words like pluralism and constitutionalism. All Xiaobing knew was that the protestors meant well and that the entire city had rallied behind them. He had never seen Beijing so united for a cause. Edward approached one of the students at the Study Room and asked, in his Mandarin-inflected Cantonese, how long she had been studying there. “Since the facility was built last week,” she answered. He then asked her which university she attended. “Chinese Univer… Excuse me, are you a Blue Ribbon?” She meant whether he was a police sympathizer. Edward figured it must have been his Mainland accent that had roused her suspicion. “Haha, no,” he chuckled and said, “I’m just a concerned citizen.” He had read about the Blue Ribbons in the paper: anti-protestors who descended on protest sites to taunt students and forcibly remove barricades. There were verbal, sometimes physical and sexual, assaults. No one knew who they really were: angry citizens who had been inconvenienced by the protests, or rent-a-mobs hired to intimidate and rough up protesters. The ones who wore face masks and black T-shirts were believed to be Triad members. Even though the Blue Ribbons were most active in Mongkok and had by-and-large stayed clear of Admiralty, Edward understood why the young girl would be guarded against a stranger who asked too many questions. Despite everything that was going on in Beijing, Xiaobing continued to hang out on the streets. The knowledge that his father was a military officer had given him a sense of security. In the past several days, however, Xiaobing had seen mean-looking men smashing car windows and vandalizing public property. The delinquents worked systematically, as if following orders. They would only wreck things and leave civilians alone. 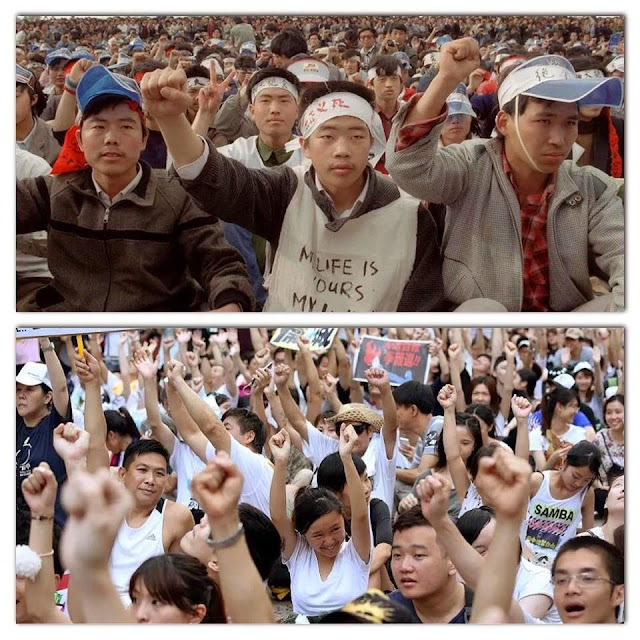 Their presence had fueled rumors that the government had released prisoners to the streets to make trouble, which would then give the army a convenient excuse to enter the city to reclaim Tiananmen Square. That’s what Xiaobing had heard from the neighbors when they discussed the situation with his parents. Until then, it had not crossed his mind that the government he was taught all his life to praise was capable of doing such evil things. 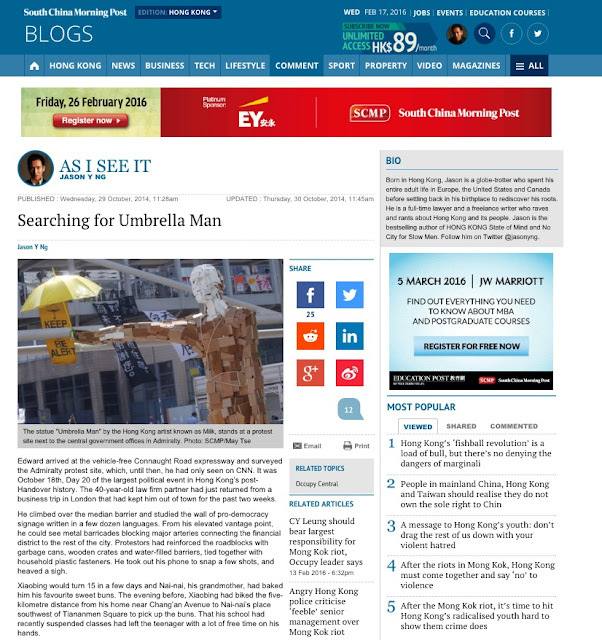 Edward found what he had gone to Admiralty to see: Umbrella Man. Created by fine arts students using scrap wood, the 12-foot-tall statue symbolized the protesters’ use of umbrellas to fend off tear gas 20 days ago. Since then, students continued to invent new defenses, wrapping foam mats around their limbs to protest against police batons, and wearing lab goggles to keep off pepper spray. Other than isolated episodes of excessive force, however, law enforcement had exercised relative restraint toward the students. Predictions that the police might use rubber bullets or mobilize tour buses to round up protestors had so far been false alarms. Edward took a picture of the towering statue with his phone, lowered his head and said a prayer. In the small hours of 4 June, two days before his 15th birthday, Xiaobing — and everyone else in the neighborhood — was woken up by the shaking of the ground. His mother thought it was an earthquake but his father knew better: the tremors were vertical and not sideways. At around 5:00am, Xiaobing found himself standing on a street corner next to some of his neighbors, watching a caravan of tanks hurtle down Chang’an Avenue. By his count, there were at least a dozen of them. Xiaobing could not take his eyes off the caterpillar tracks — there were sparks where the metal plates hit the ground. The weight of the tanks cracked the tarmac, whipping up a small sandstorm in their path. They were traveling at full speed toward Tiananmen Square, where many of the students were still asleep in their tents. But not for long. From afar, Xiaobing could hear bursts of gunshots at the square, punctuated by the low boom of tear gas blasts. He ran back home to tell his parents what he had seen and heard. The rest of the morning was a blur. Xiaobing vaguely remembered the dull sound of raindrops pattering at the living room windows. In the afternoon, he returned to the streets with his parents. On Chang’an Avenue, they saw a burned armored vehicle, which, as they would later find out, was torched by an enraged man who had lost his only son during the military crackdown. Outside Tiananmen Square, Xiaobing saw an orderly formation of tanks on one side of the now empty space. There was not a student or camping tent in sight; even the 33-foot-tall Goddess of Democracy statue had vanished into thin air. Nor was there any trace of blood. It was said that the heavy rain that morning was a gift from the gods to the Communist Party, to erase any evidence of its crimes. Xiaobing looked up to the sky and saw a cluster of helicopters. It was how the government managed to clean everything up so quickly, his father explained. The only hint of a massacre was the pockmarked walls and structures in the area. Many of the bullet holes were at eye level, that meant soldiers were shooting to kill. His father said the killers were no ordinary soldiers, because ordinary soldiers would not shoot civilians. He was convinced that they were active-duty troops sent back from the Chinese-Vietnamese border* to carry out a specific mission: clear Tiananmen Square by daybreak. After finishing secondary school in Beijing, Xiaobing moved to the U.K. to study law and took the Christian name Edward. 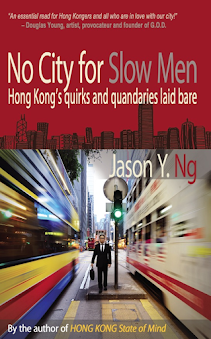 He practiced at a London law firm for 12 years before moving to Hong Kong in 2010. These days, he flies to Beijing every summer to see his old parents and visit what he calls the ghosts of Tiananmen Square. Standing in front of the Umbrella Man statue at Admiralty, Edward felt a lump in this throat. He was overcome by the striking similarities between the two student-led movements: their organization, their struggles and, on some level, their naïveté. In his prayer, he asked the gods to spare the protesters from the fate met by their brothers and sisters 25 years ago. He prayed that Beijing had learned its lessons, and that the story would have a different ending this time around. He also prayed that the students in Hong Kong would have the patience for a drawn-out war, for whatever it was that they were asking for would not happen overnight. 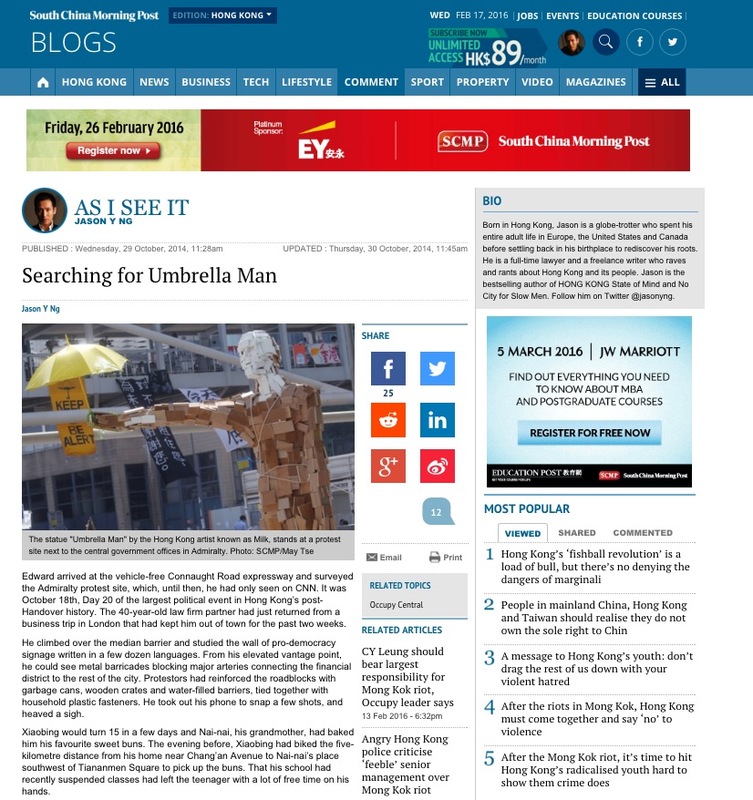 Edward then said goodbye to Umbrella Man, an old friend he had just met. This article is based on the author's personal interview with Edward, who gave his firsthand account of what he witnessed on 4 June 1989. His last name is omitted to avoid personal repercussion for him in Mainland China. *The Sino-Vietnamese skirmish of 1984 ended in early 1989. This article also appears on SCMP.com under Jason Y. Ng's column "As I See It."